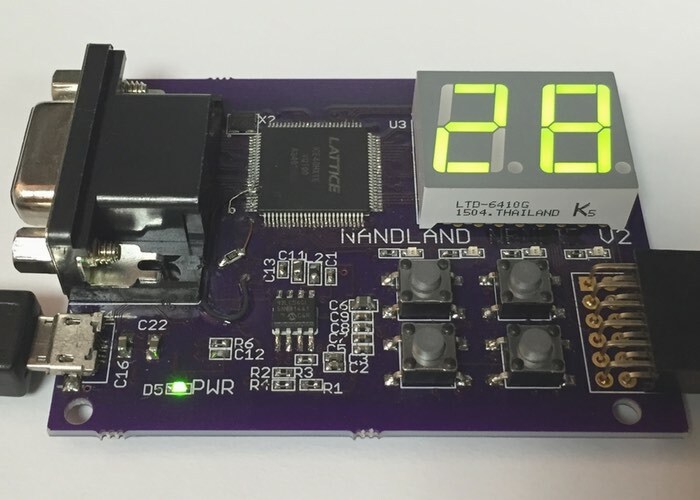 Russell Merrick as created a new development board called the Nandland Go Board that has been specifically designed to provide users with an inexpensive easy-to-use FPGA or Field Programmable Gate Array. The Nandland Go board has been created to increase the usage of FPGAs by making them easy to use and create projects with providing onboard LEDs, Buttons, VGA, and other accessories. Check out the video below to learn more about the inspiration behind the new board from its creator. An FPGA is a component that can be thought of as a giant ocean of digital components that can be connected together by wires. The code that you write makes real physical connections with wires to perform the function that you need. What makes FPGAs special is that they are very good at performing a large number of operations in parallel (at the same time). They are used in high-speed, high-performance tasks such as image processing, telecommunications, digital signal processing, high-frequency stock market trading, and many others. The Nandland Go project is currently over on the Kickstarter crowd funding website looking to raise just $1,000 in pledges to make the jump from concept to production. So if you think Nandland Go is something your projects could benefit from, visit the Kickstarter website now to make a pledge and help Nandland Go become a reality.